Just Released "Straight Talk about Sexual Harassment"
Viewers learn that harassment is a symptom of someone misusing power and that harassment can take different forms. This program encourages viewers to reflect on the cultural messages that have shaped their own attitudes. Vaping e-cigarettes can be addicting,and teens that vape have a greater chance of eventually switching to traditional cigarettes. This program challenges the belief, that e-cigarettes and hookahs are risk-free, healthy alternatives to traditional cigarettes. Teens' use of e-cigarette and other electronic vaping devices has skyrocketed. Kids think e-cigarettes are a "safe" alternative to smoking. Human Relations Media video programs are available in traditional DVD format or they can be purchased as streaming videos.Full-length online previews are available via streaming. 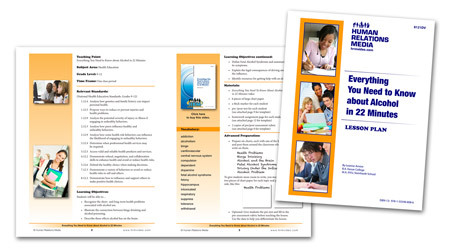 DVD Programs come with extensive teacher resource materials including pre/post tests, student worksheets and classroom activities. Help your students organize their time, work and belongings. There are approximately nine million children over 6 years of age who are considered to be obese. NDFW aims to shatter the myths about drugs and drug abuse. Eating disorders are serious and potentially life-threatening illnesses. Teenagers are the fastest growing population at risk for relationship abuse. Provide youth the knowledge they need to stand up against big tobacco companies. Teen obesity has grown to epidemic proportions in the United States. Help raise awareness to this growing danger. The best defense against STDs is knowledge. Teen stress can lead to more serious health problems. Motor vehicle crashes are the leading cause of death for teens in the US. Teach your students the positive benefits of being active now; it will pave the way for a lifetime of good health. The US has the highest rates of teen pregnancy and births in the western industrialized world. Being able to effectively communicate is vital in all parts of life. Help kids recognize and deal with the dangers they may face online. Every day, thousands of kids are afraid to go to school because of bullies. Inexperience, drowsy driving, speeding, driving under the influence all threaten the safety of young drivers. Perfect for teacher workshops or parent/teachers groups. Not everyone learns the same way. Career education is an ongoing process, filled with endless possibilities. This year plan on captivating and motivating your students in Language Arts class! Make reviewing math skills fun! Increase the amount of fruits and vegetables you eat and reduce your risk of chronic diseases. Educate your students about the dangers of prescription and OTC drugs. September 8-14,2019 Aims to raise awareness at the prevention of suicide. Red Ribbon Week is the country's oldest and largest drug prevention program. The threat of diabetes in teens is becoming a major public health concern. Build and create your own library of streaming content. Take a look at the demo page.